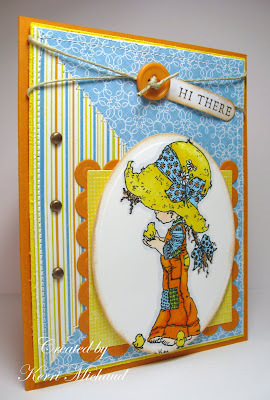 This first card is for today's sketch challenge on SCS. I finally broke down and bought a couple of Sarah Kay stamps. These images are just so precious and I couldn't resist them any longer lol! This stamp is called Precious Moments. I colored it in with Copic Markers and cut it out with an Oval Nestability. I then popped it up on foam squares on top of the Square Nesties. The dp is from the DCWV Citrus Matpack. I just love these colors! I distressed the outer edges with the Tim Holtz Distressing Tool, and distressed the image and sentiment panel with Ranger Antique Linen Distress Ink. I added a straight stitch around the perimeter and a zigzag stitch around the triangle. For accessories I added the brads, twine, and button. This next project is for this week's Fun-Frilled challenge to make a St. Patrick's Day card or project. I've been wanting to make one of these round top boxes which you can find the template for here. 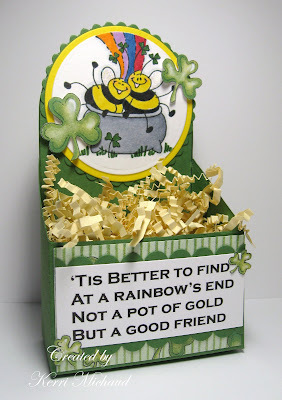 I used this adorable Stampendous stamp called Lucky Bee Friends. I colored the image in with Copics, adhered it to some layered Circle Nestabilities cut from Summer Sun and Garden Green cs. The shamrocks were cut out of the dp that I found at Michael's. I computer generated the sentiment, because I thought it fit perfectly with these two little bee friends. I added the scalloped borders, and once again cut a couple of shamrocks out of the dp. I hope you like it and thank you so much for stopping by! Make sure to upload your St. Patrick's Day inspired creations to FUNF4 on SCS and be entered to win Michelle's fabulous blog candy!